Doom demons have it hard. They’re just minding their own business after invading Mars in a firey blaze, then some impolite marine arrives and blows most of them up in a furious rampage with blood and guts flying everywhere. But this ‘Mr Friendly’ Doom mod aims to give those demons a break, as it replaces all the shooting with talking, providing each hellish monster with a name, and giving you free reign to just chill out and explore. Created by JP LeBreton, you’re going to want to play this if you’re a pacifist, or ever paused to wonder whether those demons you blew up had a heart after all (and no, that’s not just because you saw it beating in a bloody puddle on the floor). As well as helping the demons out, you can go fishing and do your best to make the half-destroyed home of these misunderstood foes a little bit better. One quest even has you trying to find a fish for one demon that he can give to his kid as an easy, low-maintenance pet. It probably helps that it’s really easy to flush, too. 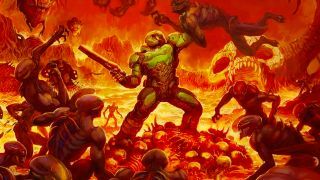 With Doom Eternal coming out soon, this wholesome mod could be exactly what you need to balance out all the demon-murdering you’ll be doing on Earth. By the looks of it you’re going to be blasting demons in the face in some all-too familiar surroundings, and who knows? A future Doom Eternal mod might eventually turn its own enemies into sympathetic characters, just like this one. Here’s some more games like Stardew Valley, or watch the video below to see what’s going on in gaming this week!